Responding to the theme of ‘Displacement’, this altered book , created from a copy of Zorach Werhaftag’s ‘Uprooted’ published in 1946, won the Wiener Library’s International Bookart Competition in 2014. Throughout history the systematic destruction of ‘undesirable’ literature, art and sacred texts of oppressed and minority people has been used as a means of cultural obliteration by totalitarian and oppressive regimes. 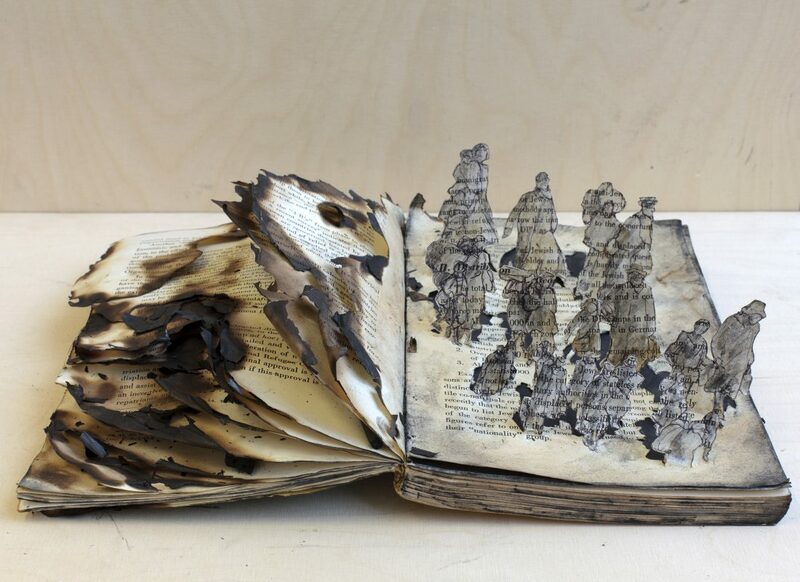 Book burning is a violent example of censorship, and this work directly references the Nazi’s Säuberung, or purge, by mass burning of ‘Un-German’ literature, including many thousands of Jewish books. The book itself tells the story of destruction and migration, but the figures that emerge from the page embody the text so it cannot be forgotten.